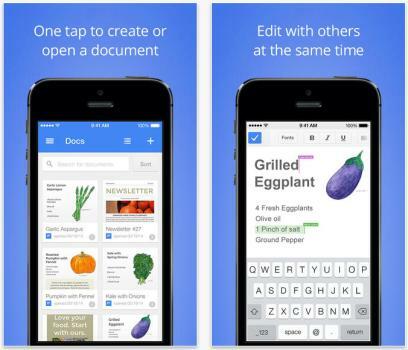 Google announced the release of mobile apps called Google Docs and Google Sheets on its official blog on Thursday. Google Docs and Google Sheets, which are a pair of free standalone mobile apps for Android and iOS will allow smartphone and tablet users to stay productive on the go. The apps can be downloaded from the iTunes store for iOS and Google’s PlayStore for Android devices. Earlier users were able to access the documents via Google Drive or the web but now with the help of new Google Docs and Google Sheets apps users will be able to create and access documents and spreadsheets on their mobile devices. Google has rolled out the Google Docs and Sheets app and will soon be launching its presentation app ‘ Google Slides ‘. The idea is that you don’t need to a data connection now to view, edit or create files and that you can work offline as well with the help of Google Docs. Users can share and work together on documents and respond to comments. Moreover, the fear of losing data will no more trouble you as it is automatically saves it on the Cloud server. The Google Sheets app allows you to create and edit spreadsheets from anywhere. You can share spreadsheets, enter/sort data, Format cells and more, all without an internet connection. By launching the new Docs, Sheets, and Slides apps, Google will now be able to compete against Apple and Microsoft on productivity apps. Microsoft’s Office apps for iPad are already quite popular on the Apple app store and Apple also offers free productivity tools iPhones and iPads.